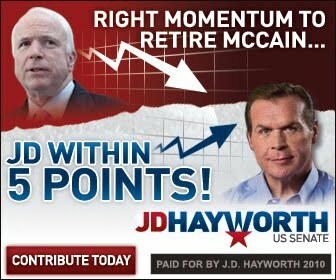 IC Arizona: Come help JD Hayworth dial for dollars tonight and/or Satuday! Come help JD Hayworth dial for dollars tonight and/or Satuday! The latest Rasmussen poll shows McCain losing ground, he's lost 5 points and has only 47% of likely Republican primary voters, dangerous territory for an incumbent according to Scott Rasmussen. We can beat him! But we need your help. Please stop by and help us dial for dollars, we need folks not just Thursday but Saturday from 1-4pm. If you can only make a couple of hours during those blocks of time, come by anyways, every little bit counts.